NO, this isn't a racist post. This is what we affectionately call all UPS delivery men/women. A person dressed in brown, in a brown truck that brings you all sorts of goodies in brown boxes - yup definitely a Santa Claus. I kept glancing out of my window all morning long hoping to catch a glimpse of the brown Santa Claus. Sometime last week I made a purchase that I have been anxiously waiting for. I had been tracking my package since I got the shipment confirmation from ALLBRANDS. Sometimes I hate tracking information don't you? I tracked my package last week and was giddy with excitement when I saw it reach Montgomery, AL on Friday. I thought for sure I would have my package the next day... but, I forgot: UPS ground does not deliver on Saturdays. So I had to wait all weekend long! Like I said, tracking info - sometimes a good thing, sometimes a curse. So what was I waiting for all weekend long? 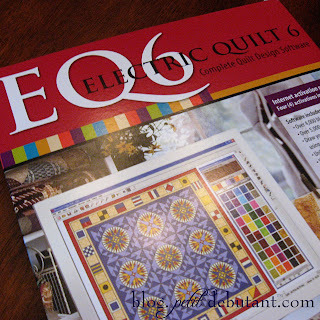 I'm so excited to get acquainted with this quilting design software. So excuse me if I disappear for a few days! You can be sure I'll be posting reviews and such as I go along! If you want to learn more about EQ6 visit their website. Have you tried out this software? Own it? What do YOU think about it? I am so jealous - please let us know how much you love this software - you are so lucky!!! I just got mine in the mail a couple of weeks ago! So far I love it! Have fun playing with it, it is addicting! My daughter calls the UPS truck the Santa truck too! This software looks dangerous. Can't wait to see what you come up with.